I´m Alba, the Director of the Barcelona office and I know Barcelona like the palm of my hand. Here is my recommendation for a great place to have dinner. One of the best restaurants in Barcelona in terms of quality-price is La Panxa del Bisbe in Torrent de les Flors 158, in the neighborhood of Gracia. It´s a very pleasant place and the food is excellent, a great combination of creative tapas with high quality fresh ingredients. This place is a perfect place to have a romantic dinner do with a small group. Tip 2: Noodles, noodles, noodles! I´m Claudia, a huge fan of Asian food and the spicier it is, the better. So my recommendation is RedAnt in the street Tiradors 3-5. In this restaurant in the Born area you can try one of the best Phôs in Barcelona. Phô is a traditional Vietnamese meal served in a bowl with rice noodles in either chicken, beef or vegetable soup, delicious and ideal to warm up your body in a healthy way. Don´t expect a fancy place because it´s more kind of a tavern with a lot of tables in a row. If you´re lucky enough you can get your table without having to wait in a queue. I´m Angy and I am really passionate about Japanese food. Maybe it has something to do with the fact that that when I was little I used to watch Japanese cartoons at lunch time. My recommendation is Ramen-ya Hiro, Girona 164. If you want to enjoy an authentic Japanese ramen without leaving Europe, you have to visit Ramen-ya Hiro. This small place in the heart of Eixample is the first restaurant specialized in ramen in Barcelona, a typical noodle soup originally from China, served with different complements, that has become a Japanese trade mark. In Ramen-ya, Hiro is served in a big steamy bowl and you can choose between the one with miso, soya or fish sauce although I definitely choose the first one because it´s absolutely delicious! The chef, Hiro Yoshiyuki, prepares both the soup and the noodles on a daily basis so it´s a perfect choice for chilly winter days in February. I´m Deborah, 45 years-old, with two kids and a French partner who works in the food industry and takes everything that is related to food very seriously. So for the past 14 years that I´ve been living in Barcelona, we have been to a lot of restaurants: traditional, brand new, Michelin star and I can tell you that the best of the best in my opinion is Vicino. It is an Italian pizzeria in the Barceloneta area where the food is simple and of very high quality. They make the best pizzas in Barcelona, Spain, Europe and in the northern hemisphere. The waiters are very polite and kind and even the music is great. It is a perfect place to enjoy the sun, the beach and all the best things that Barcelona has to offer. I´m Milena, a running addict and a healthy food lover because I know that if I eat well, I run faster, and that makes me happy. I am also allergic to gluten so here are some options if you want to indulge yourself in a healthy gastronomic experience. My recommendation is Flax&Kale, Tallers 74B. Flax&Kale, the first flexitarian restaurant in Barcelona, its located in the heart of the Raval area. According to its slogan “Eat better, Be happier, Live longer”, its gourmet menu is predominately vegetarian, with only 20% of animal protein from blue fish. So if you want to experience a fascinating world of sustainable food that’s also incredibly healthy, Flax&Kale is the perfect place. You have to try the maple-glazed doughnut with one of the freshly-squeezed Teresa´s Juicery juices, a real vitamin bomb and pure pleasure. I´m Jean-Phillippe, Canela´s IT guy, I’m addicted to new experiences and technologies and I love culinary adventures. Having wheat intolerance, I prefer Asian and oriental recipes although since I´ve been living for 10 years in Barcelona I have also fell in love with authentic Catalan cuisine. I usually choose light and energetic meals for lunch and recommend a small Thai restaurant for a perfectly balanced and spicy experience. Be sure to book before going to El thailandes because it’s quite small. What I particularly like about this restaurant is that it has an open kitchen and you can see how food is prepared and that you can choose the level of spice seasoning you want in your meal. I´m María, 22 years old and a lover of healthy, ecologic and slow food. My recommendation is a very central place where you can work, inspire yourself, or meet your friends in a great atmosphere. My recommendation is Al sur café, Roger de Llúria 23. Al sur café is the best restaurant in a bohemian and cheerful style to have a break from the hustle and bustle of MWC or Barcelona´s downtown streets and its slogan is “whatever you want, whenever you want”. So what to order? It´s up to you, but I recommend you to leave some space for some of the desserts because they are exceptional. I´m Victor, Canela´s accountant, Catalan by birth and in love with the fact that I can live and enjoy the city of Barcelona. I´m not very fond of experimenting with new culinary experiences, but sometimes I let go and I enjoy as long as I am with someone who shares my curiosity. So I recommend Habana Vieja, Carrer dels Banys Vells, 2. A charming restaurant that makes you feel as if you´re in the city of Habana for a moment. Hidden in the old part of Barcelona, just behind Princesa street, you can´t miss ropa vieja, congrí, black beans, Habana style crème caramel pudding among many of the delightful dishes of Cuban cuisine. And always with great music that makes your body move spontaneously. I´m Marta, a tapas lover. 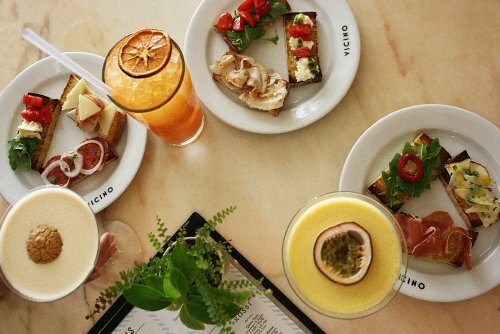 Whenever I can, I go out for vermouth or a beer with some tapas on the side and I´m a kind of person who always says: “Can we order a bit of everything and share? A classic among classics of the Poble Sec, one of the parts of Barcelona famous for tapas bars. I know I may sound as one of the typical tapas guides in Barcelona, but this place is really worth it. This small bodega is an authentic corner where you can try out a never ending variety of wines or beers as well as delicious tapas. Make sure to go early and with no more than three people because this family bodega of the four generations of the Quimets has just two tables and a bar and is always full. It´s Deborah again. One of the advantages of being the founder is that you can give two out of the ten tips. Although all these recommendations show a culinary diversity that exists in Barcelona, we all know that what foreign visitors want is paella and sangria. And why not? So that´s why, if you want an unforgettable experience, I recommend that you visit the Salamanca restaurant in the Barceloneta area. They offer all the typical Spanish dishes you can imagine when you think of the Spanish food and if that wasn’t enough the waiters are even dressed in the uniform of Manuel from Fawlty Towers.